I love chillies! They don’t love me so much but I love them, the colours you can get and the way they can transform just about any dish, even chocolate, is amazing. 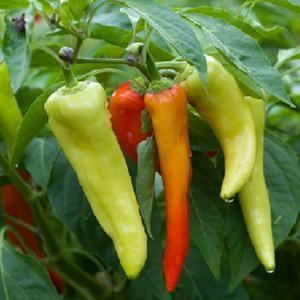 I’ve grown them most years, to varying degrees of success but not really ventured past the standard varieties except for my beloved Hungarian Hot Wax, discovered in my first year of growing by an old friend. A friend that I’ve known for 2 or 3 years now is a bit of a forrager chef like myself, but on a much grander scale – she has a bigger kitchen lol – and loves to make jams and chutneys and brews too. She makes a fabulous chilli jam every year and this year I vowed to try and make some for myself. She also put me onto chilli vodka, which although not to my taste so much, is an absolute winner with my husband and so easy to do so an easy way to please my weary man on an evening without too much effort. I even went as far as drying out a big batch of chillis in my dehydrator for even easier use! I’ll share my recipes and methods over the course of the rest of the year. 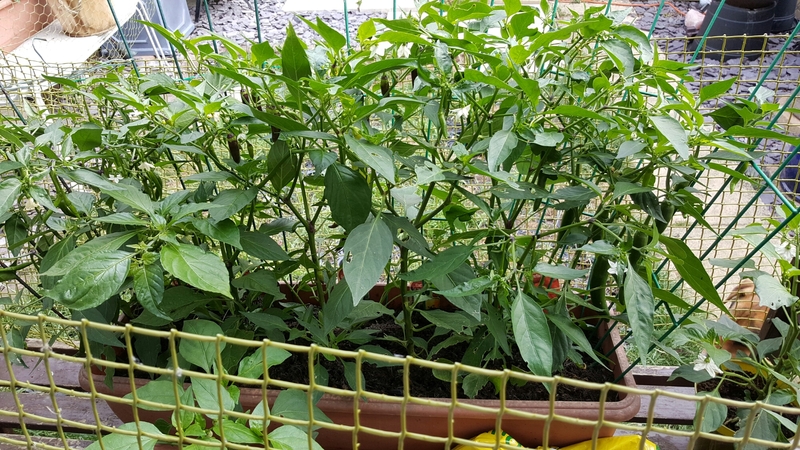 I planted the hungarians and the vampires but left the cayenne as mum and dad had planted up one of those big buckets worth and had a cajillion of them already so was happy to take some of those off their hands!! You don’t get many seeds in the pacjets of specialist chillis so I had 7 hungarians and 6 vampires to plant. The vampires were rubbish, only 2 grew, but 5 out of 6 hungarians grew and I wrote to Suttons to complain and got a fresh packet of vampires for next year so alls well there. 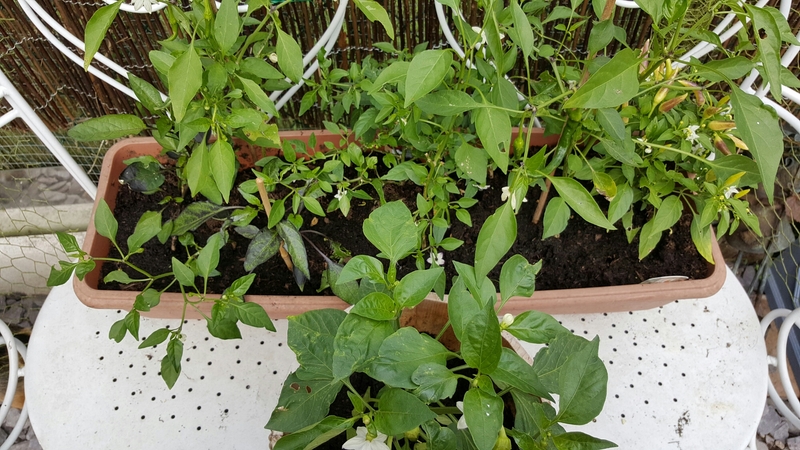 The chillis from mum and dad when I eventually got them were leggy and half eaten by slugs. Not a good start all round!! So, off I toddle to the local garden centre for a couple more plants… yeah…about that. 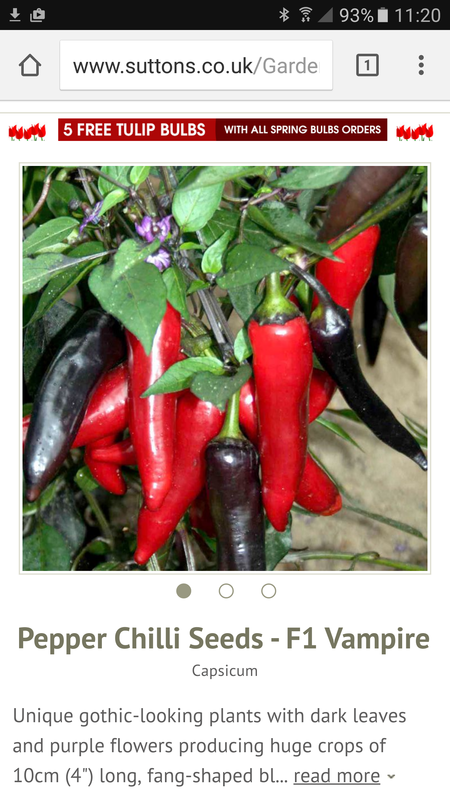 Never take husbands shopping…for anything… ‘have you seen this one, how about that one’ led to me walking out of there with not 2 or 3 but about 10 more chilli plants!! Of varying colours, sizes, strengths and varieties! They’re going to look fabulous all together. So I now have 2 troughs of chillis plus 5 pots with the hungarians in. Placed up on my garden benches and reinforced from naughty puppies and protected by bi-nightly slug salting, they’re doing ok – despite next door’s cat knocking the whole lot over one night, strewing them all across the garden. To date, the first to bear fruit have been the gusto purple (actually purple!) 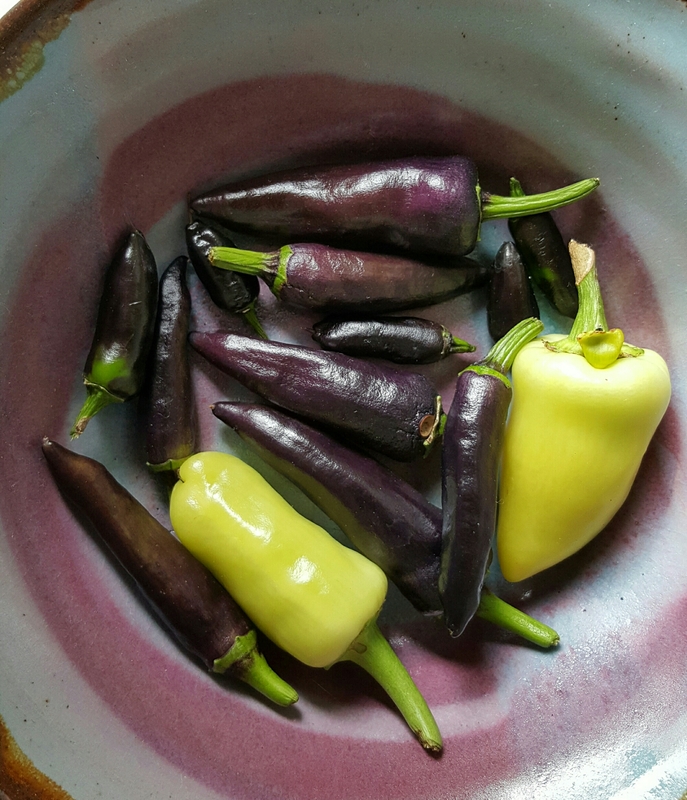 and the chenzo (black) and I have a couple of santa fe grande (yellow) in the freezer not properly ripened but saved from the jaws of the slugs.